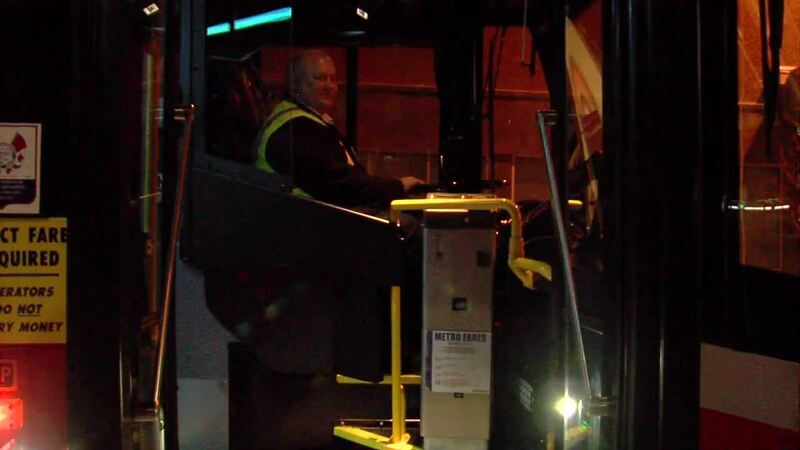 The Kansas City Area Transit Authority has made subtle changes at bus stops along one of the busiest routes in the metro, and transit leaders say this new vehicle for change is helping reduce crime. KANSAS CITY, MO — Yvonne Llewellyn has owned the Jamdown Kitchen on Prospect nearly 7 years. “On the menu we have oxtail, curry goat, everything, red beans and rice,” Llewellyn said. She's seen the police cars race up and down that corridor, but soon there will be a new plan in place aimed at reducing crime in her community. Kansas City Area Transit Authority President Robbie Makinen hopes to play a vital role. “I have a report that was given by the chief of police that said 20 percent, from the time, a year before to a year after… the Troost Max came on line, crime went down 20 percent,” Makinen said. Makinen's new approach to tackle crime in more than just thinking outside the box, he said. “We’re kind of blending that in to think 'outside the bus,' if you will," Makinen said. KCATA Senior V.P. Richard Jarrold described the "before" scene. “There was a vacant lot, there was muddy paths through it to the bus stop, no lights, buildings across the street were empty and vacant,” he said. In the last year KCATA has improved lighting along the Troost corridor. Crews have removed potential hiding places, added cameras (some not in plain view), and so much more through KCPD’s Crime Prevention Through Environmental Design (CPTED) approach. The ideas that have been implemented have resulted in fewer burglaries and homicides along the Troost corridor. The transit authority has now invested $56 million to do the same along the Prospect corridor, where Llewellyn’s restaurant is located. “That sounds like a great idea,” she said. The transit authority admitted there’s still a lot of work that needs to be done. Not all crime has gone down along the Troost corridor, but Makinen said with a group effort between leaders, the police and members of the community, that will change. “Public transit is the one thing. It’s that one thing that meshes everything from education to job access, health care, all of it. It’s an absolute fact that a rising tide floats all boats. So, if you think this doesn’t affect you, it does. We all need to get in a boat, garb an oar and row,” he said. Changes along the Prospect Max Corridor are expected to be complete by December.